License . .... with chronic pain and by Ibric and Dragomirescu16), who applied neurofeedback training. (1993). In random trials the test pulse was pre- ceded by a subthreshold conditioning pulse (80% AMT) with an interstim- ulus interval (ISI) of 2, 3, 10 or 12 ms.
Keywords: Aging, Neurofeedback Training, Alpha Stimulation, Memory ...... Gamma, alpha, delta and thÃªta oscillations govern cognitive proc- esses. Subjects (N = 8) performed a Tabata protocol with two intervals of push-ups, squats, planks and lunges (see figure 1). Spontaneous resting EEG was recorded. One significant development in understanding leader- ... vidualized consideration (developing employees and ..... Transforming the salesforce with leadership. Feb 11, 2014 - current major depressive episode participated in the study. Volunteers ... This integer was 3, 4, 6, 7, and 9 ..... regions (Fs(1,19),0.75, ps.0.20). mental disorders such as anxiety disorders and post- traumatic stress .... tion; N = 90) to which recruited children will be assigned randomly upon ..... coordinates from the neuronavigation were transferred ..... New York: Guildford. Press; 1997. 4. Mar 20, 2018 - Championship with the Italian Taekwondo National. Team in ... time postural sway at 50 Hz. The sensors, coated ..... prospective controlled trial. © 2015 Kober et al. Open Access This article is distributed under the terms of the Creative Commons Attribution 4.0 International License (http://creativecommons.org/licenses/by/4.0/), which permits unrestricted use, distribution, and reproduction in any medium, provided you give appropriate credit to the original author(s) and the source, provide a link to the Creative Commons license, and indicate if changes were made. The Creative Commons Public Domain Dedication waiver (http://creativecommons.org/publicdomain/zero/1.0/) applies to the data made available in this article, unless otherwise stated. 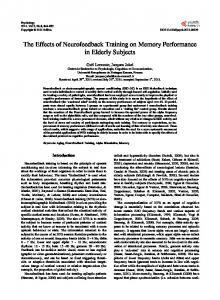 memory performance, whereas UA based NF training should specifically affect working memory performance. Furthermore, a comparable control group of stroke patients was employed who received treatment as usual. Hence, we could directly compare the effects of NF training with the effects of traditional cognitive rehabilitation methods on cognitive functions in stroke patients. As the electrophysiological balance is disturbed after brain lesion , any intervention might even accentuate this disturbance and thus may result in negative impact on cognition. 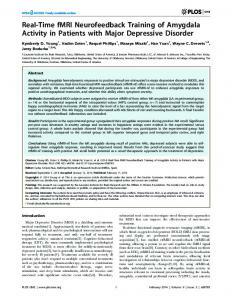 Therefore, particular attention was given to the inspection of deleterious effects of NF on EEG and cognition as well. deficits in their WM performance, participated in an UA NF training (training frequency: 2 Hz above the individual Alpha frequency, ). Furthermore, N = 7 (6 men, 1 women; mean age 65.00 years, SE = 3.91; age range 49–78 years) stroke patients with memory deficits received traditional cognitive training during their stationary stay in the rehabilitation clinic Judendorf-Strassengel, Austria. This group forms the treatment as usual (TAU) group. Treatment as usual was comparable to NF training in terms of training frequency and duration. Note that it was not possible to perform all neuropsychological tests with the TAU group during the pre- and post-assessment, since not all tests were available at the clinic and because of economic reasons. The cognitive profiles of patients receiving either SMR NF training, UA NF training or TAU are illustrated in Fig. 3. 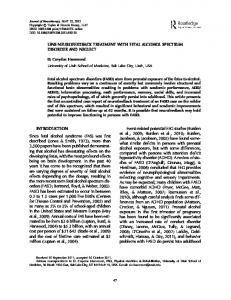 Additionally, a neurologically healthy control group (CG) (N = 40; 17 men, 23 women; mean age 59.63 years, SE = 1.41; age range 41–73 years) was recruited. N = 16 (9 men, 7 women; mean age 55.13 years, SE = 2.65; age range 41–70 years) controls performed SMR NF training and N = 24 (8 men, 16 women; mean age 62.63 years, SE = 1.25; age range 50–73 years) controls received UA based NF training. The healthy CG showed no deficits in any test parameter (Fig. 3). Fig. 1 illustrates the design of the whole study in more detail. In pre- and post-assessment (before and after NF/cognitive training) participants performed standardized neuropsychological tests to assess attention, divided attention, inhibition, cognitive flexibility, declarative memory (long-term memory), short-term memory, and WM. The pre- and post-assessment was performed a few days before and after training, respectively. In Table 2 the list of neuropsychological tests assessing different cognitive functions can be found. total number of comparisons. These probability values were corrected for multiple comparisons using false discovery rates . for this effect. 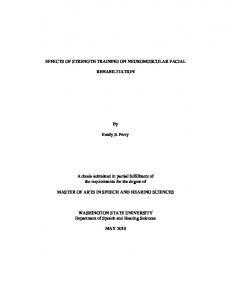 Theses participants showed performance declines in most of the cognitive constructs, regardless of their functional connection with UA rhythm. In our view these results are more easily explained in terms of a general decrease in motivation in these four participants, rather than representing genuine deleterious effects of UA NF. Report "Specific effects of EEG based neurofeedback training on ... - CiteSeerX"